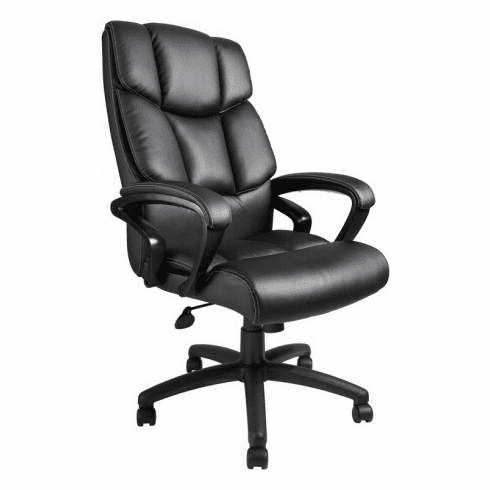 This high back executive chair from Boss Office Products features top grain italian leather upholstery, overstuffed seat and backrest cushions for added comfort, NTR no tools required assembly for fast setup, padded leather loop arms, ergonomic design backrest with built in lumbar support, waterfall seat edge that helps eliminate leg fatigue, tilt with tilt lock and adjustable tilt tension, 360-degree swivel, pneumatic seat height adjustment and a five star nylon base with dual wheel carpet casters. Optional knee tilt upgrade available for a minimal charge. Dimensions: Seat Size: 21"W x 19.5"D. Arm Height: 27" -30.5"H. Seat Height Adjustment: 20 -23.5"H. Overall: 45 -48.5"H x 27"W x 28"D. Six year limited warranty from Boss. This chair normally ships within 2-3 business days.